Comments: About the size of a sparrow, this is the smallest of the rail species. Little is known about behavior, population, threats, or how they are affected by habitat management activities. Breeding in the Great Plains is localized and scattered. Due to their secretive nature, many sites with nesting Black Rails may not yet be identified. In the Great Plains they are found in riverine marshes, shallow saline marshes, wet prairies with cordgrass, and in spring seeps with permanent water. Black Rails winter along the southern Atlantic and Gulf coasts. They feed on small invertebrates and seeds. Both juveniles and adults have black bills, rufous napes and dark backs and wings speckled with white. 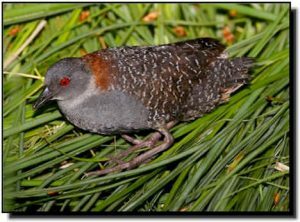 Downy young of all rails are small and black; hence, young of any rail species could be mistaken for a Black Rail.